NOTE: TEH Doorbell can also be run on most systems through the GUI by "double-clicking" the file "doorbell_2.6.1.py", however by not running the software through a terminal you will not see any error messages, should they occur. 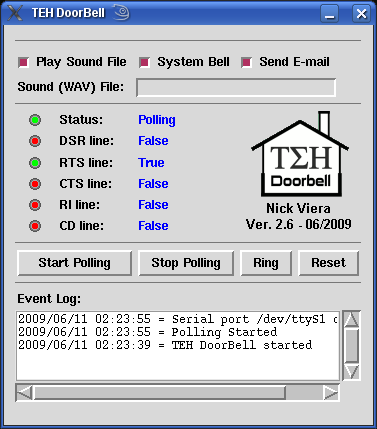 TEH Doorbell software is distributed under the terms and conditions of the GNU General Public License (GPL) version 3, which can be viewed in full at the following link: http://www.gnu.org/licenses/gpl-3.0.html. The software files can be downloaded from either the Zip or Gzipped-Tarball files below.